I’ve written about Niseuo here and here, so I don’t want to go repeating myself. 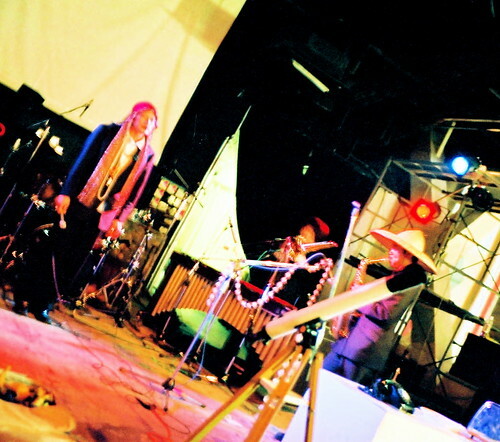 I’ll simply keep it short and mention, again, that Niseuo — which means “False Fish” in Japanese — is one of the greatest, maddest, most massively surreal free jazz ensembles on the planet. And punked out too, in the sense that their music is both formally free (but oh so tightly orchestrated) and also emotionally volatile. This time around Matsumoto-san, the singer, added some brilliant improv with a toaster oven and followed this up by playing the plate that was being ‘cooked’ using a pair of forks for drumsticks. Of course, I don’t just mean that Matsumoto-san was making noises with a plate — he was playing it, transforming the thing into a musical voice synched perfectly in tempo with the rest of the band. 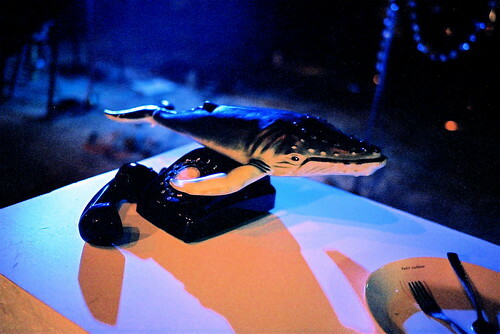 Niseuo also performed the ‘telephone conversation’ bit that I’ve loved so much before, although this time the conversation was cut short with a plastic whale (false fish!) bludgeon. After the show, Omori-san was kind enough to give me an advance copy of the new CD that they’re working on now. Only nine minutes long, but already great. The CD begins with a kind of processed New Orleans jazz stagger that’s made to sound like an old 78, and then moves into a nice Armstrong-influenced deep jazz vocalization that sounds like some of the more abstracted Waits. I can’t wait until the CD is completed. And I’ve been asked to take the photos for the inner sleeve. Here’s Niseuo in action at the Bridge. Omori-san is Niseuo’s bass player and is really a super sweet guy. He is, unbelievably, self taught. 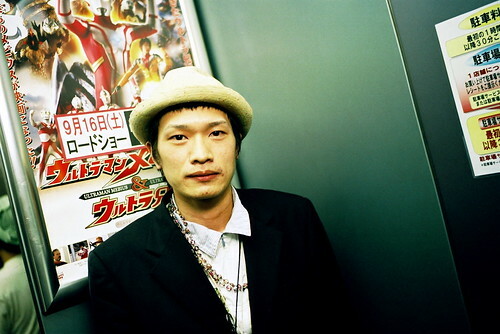 Here’s Matsumoto-san, standing in front of an Ultraman poster. We also saw several other bands play, including the band pictured above, which is called Rich Pompous, or “Richy Pompous” in the Japanese pronunciation, which I much prefer. They sounded a lot like a two-person OOIOO, which is no bad thing as far as I’m concerned. Really nice harmonies, syncopations, sudden tempo changes, and time signature changes. And a little bit of recorder music thrown in as well. There was also a rock unit made up of three women, which did in fact totally rock, but I’ve unfortunately forgotten the band name. And early in the evening I got to see a solo Menkerou Manji show — just piano and voice. Kanako, the singer, tells me that the band is named after a character from a famous Japanese surrealist novel. I can’t be quite sure, but from what I could hear it seems that her lyrics are inspired by surrealist imagery as well, with lots of eyes and seas, and that kind of thing. Or maybe it’s just be my bad Japanese making a hash of things. In any case, Kanako invited me to see the full Menkerou Manji play at Bears, which is a very small live house located near Namba Station. In fact, Bears really is just a small, almost square, basement room that’s been painted black in all corners. But it’s a great place to see shows because you’re right there — it’s almost more like being at a house party than at a concert, which is always nice. Anyhow, the full compliment MM turned out to Kanako and a young drummer with long hair and a psychedelic shirt. 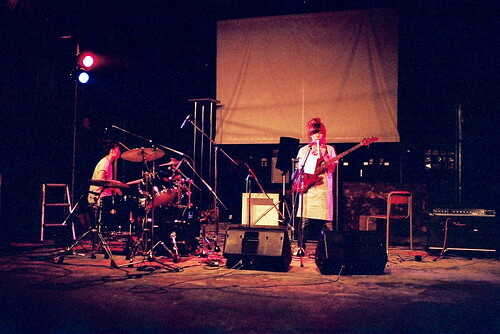 His drumming really complimented her piano playing — a kind of loping combination of rock and jazzish free improvisation. The big surprise for me, however, turned out to be Ebi Hara (which means “Shrimp Field”), an unbelievable solo drum act. 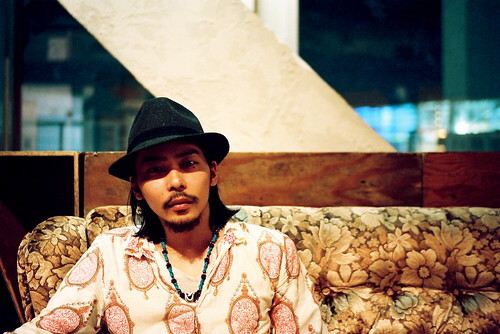 Of course, Ebihara is also a Japanese surname, so maybe the band name was just the drummer’s name? I don’t know. The drummer — Mr. Ebi from this point on — pulled the drum kit off the stage and reassembled it in the middle of the room, so that he was surrounded by the audience (about 15 people). And then he played for 40 minutes, sometimes singing, but primarily using the drums. Each part of his set was a full improvisational composition, with tempo changes, melodic rhythmic passages, atonal intensities, shining cathexis. However you want to put it. What is it with Japan and unbelievable solo drum acts?